It was demoralizing. Here was the wreckage of past glory. Britain had once been the workshop of the world, brimming with money and confidence. Eminent Victorians travelled the globe, studying everything from exotic plants to Renaissance architecture. Ruskin wrote The Stones of Venice, Owen Jones wrote The Grammar of Ornament, and all these influences were made manifest through the power of the Industrial Revolution in stone, wood and plaster through the streets of London and the nation’s other rapidly growing cities. Why should we save the relics of that period now? There are many reasons, but two practical ones are that they were made of better materials and demonstrate a better sense of proportion than most modern town houses. In publishing The Victorian House Book we wanted to foster an awareness of idiom and an awareness of materials. Victorian houses were built in the last age of craftsmanship, when joiners still set up shop on site and ran up the windows, doors and skirtings to order. Plasterers created far more elaborate designs than are usual today and decorators mixed the paints in front of the client to achieve exactly the colour scheme desired. There was much greater awareness of architectural propriety than is usual today. Over-decoration was a sin widely criticized by leaders of taste, but much of the elegance of 18th-century architecture lived on and with so many individual builders exercising their own choice of window and door surrounds, there was a fascination of detail largely if not wholly lacking in modern housing estates. Functionalism, the architectural equivalent of proletarianism, was yet to make its appearance. In 1910 a new house was built in the Michaelerplatz in Vienna which had such a blank façade, lacking decoration around the window openings, that it became known as the house without eyebrows. It upset the Emperor Franz Josef so much that he never again left the Hofburg palace through the Michaelerplatz gate. In the decades that followed, the Modern Movement took root and Victorian houses were despised as bourgeois and fussy. In the 1950s people ripped out the decorative cornices and blanked out fireplaces, panelled doors and banisters with hardboard and tried to make their Victorian houses look like Bauhaus creations. In the 2000s, the removal of architectural detail has started again, this time in the name of Minimalism. The Victorian House Book stands against this kind of thoughtless desecration. A Victorian house, especially when built to a pattern by speculative builders, may not be the height of architectural sophistication, but it has qualities of proportion, solidity, workmanship and sheer comfort after generations of occupation that entitles it to care and concern as part of the national heritage. By restoring a house sympathetically, using natural materials wherever possible, we both honour the work of past craftsman and create an aesthetically superior environment in which to live and move. 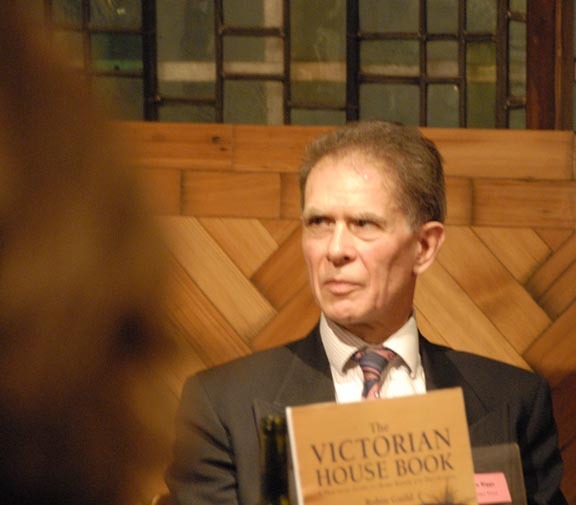 To see pictures of The Victorian House Book launch party, please visit our Facebook page (below) and click on Photos.